Despite its minimalist sensibility the SLX delivers the same powerful and detailed sound that has made Klipsch speakers bestsellers. It employs dual 4.5-inch magnetically shielded IMG (injection molded graphite) woofers and a 1-inch aluminum dome tweeter coupled to an exclusive round Tractrix® Horn for a dynamic three-dimensional soundstage. Powerful magnet structures provide high efficiency and low distortion. It also features two custom-engineered sculpted ports on the front baffle for intense low-frequency extension. In the drive for simplicity the SLX can be positioned horizontally or vertically and serve as a main surround or center channel speaker. Furthermore it can be hung on a wall or mounted to a stand. A Positive Lock Attachment™ on the back of the speaker ensures simple and reliable wall mounting to the included wall bracket without requiring additional hardware. While on the wall bracket magnetic positioning allows for precise rotation within a 30-degree range meaning the user can widen or constrict the soundstage based on audience size. Mounting to a stand is made possible via two ¼"-20 threaded inserts located on the rear of the enclosure. 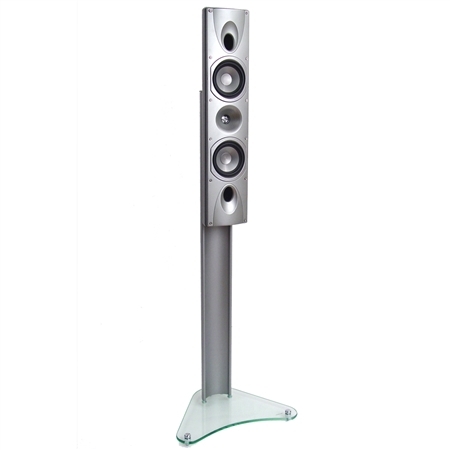 With a silver/titanium finish the smooth and sculpted shape of this dramatic speaker nicely matches today's striking flat-panel displays. With its gray magnetically-attached grille in place the SLX offers a sense of elegance that flatters a variety of home décors but take the grille off and you get an aggressive and powerful statement that exudes extreme performance. The SLX is also packaged and sold individually so that users can easily create two-channel or multi-channel configurations. A first of its kind in the Klipsch Synergy Series lineup the SLX not only serves up affordable high-end sound but also shows why Klipsch is America's number one speaker brand.